Zipping Away! — Let's Go! II'm just kidding... I didn't buy this awesome car. No, I rented it from Zip Car last Thursday! 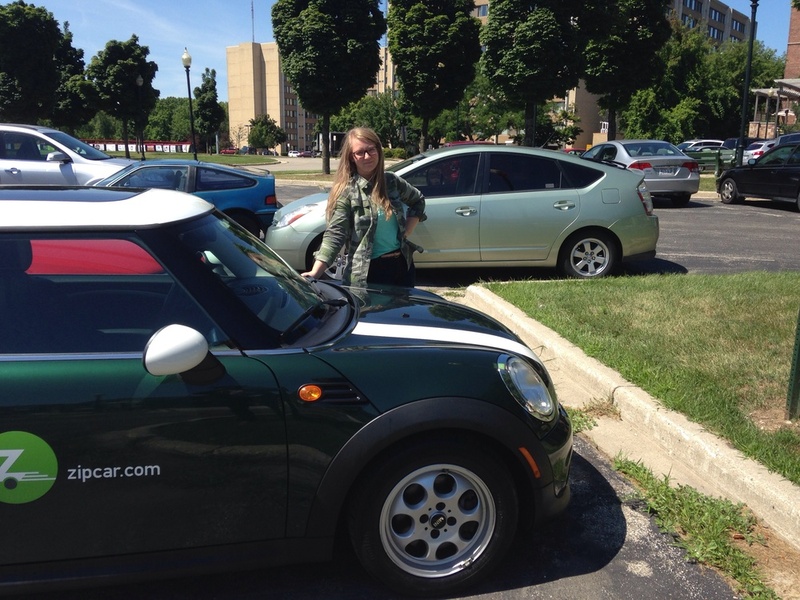 Zip Car is a car sharing service I decided to subscribe to when I sold my car this spring. Cars are available hourly or daily, and there are lots of locations through Milwaukee you can find your car. Why is Zip Car important, you ask? To that I respond with a question: How else is a car-less person to easily travel from the East Side to the Target by the stadium? The Target by the stadium where there are, for some reason, barns nearby? There are three driving plans you can subscribe to, and I subscribed to the Occasional Driving plan since I don't need to use a car very often. It's the plan with the most up front, but no monthly fees, which I like to avoid. With a monthly fee, you get reduced rates on any car sharing you do. I signed up easily and waited about five days for my Zip Card, which is what allows you to unlock the vehicle you've rented. Keys are kept inside the vehicle, since the car can only be unlocked with your card. Included with each car is gas, insurance, and 180 miles per day. Every direction is spelled out step by step, and there aren't so many steps that anything is complicated. Here in the driver's visor is the gas card; you can fill up using this card at any gas station, which is one of my favorite features of this program. You don't have to return the car full, but under about a half a tank you would probably take a few minutes and fill up.